The Senate Judiciary Committee hears testimony Friday from people who know U.S. Supreme Court nominee Brett Kavanaugh. Kavanaugh wrapped up a third day of questioning Thursday, a day after declaring his independence as a judge, but refusing to be pinned down on questions related to the investigation of President Donald Trump and his 2016 campaign’s links to Russia. But Kavanaugh declined to take a position on whether a president can be subpoenaed and required to answer questions, whether a president can pardon himself if charged with wrongdoing, and whether he still believes, as he wrote two decades ago, that a president can fire a prosecutor who is investigating him. The questions related to the ongoing investigation being conducted by special counsel Robert Mueller into whether Trump’s campaign colluded with Russia to help him win and whether Trump, as president, obstructed justice by trying to thwart the probe. Mueller has not subpoenaed Trump, but has been unable to reach an agreement for Trump to testify about his actions and his campaign. On Thursday, Kavanaugh faced new questions about his views on the Supreme Court’s 1973 decision legalizing abortion rights in the U.S., saying again he believes the ruling is settled law that has been reaffirmed in more recent decisions. But Kavanaugh declined to offer an opinion whether he thinks the decision was correctly decided from a legal standpoint. Numerous women’s groups are vocally opposing Kavanaugh’s nomination, fearing that he would provide a crucial fifth vote with four other conservatives on the court to overturn the abortion ruling or further restrict access to the medical procedure. Kavanaugh asserted “no one is above the law in our constitutional system” and that “no matter your station in life, no matter your position in government, it’s all equal justice under law.” But he declined to say whether a sitting president, like all other citizens, must respond to a subpoena to provide testimony. “I can’t give you an answer on that hypothetical question,” the nominee said. In the 1990s, as an attorney, Kavanaugh took part in an investigation of then-president Bill Clinton that compelled Clinton to testify. Years later, having served in the George W. Bush administration, Kavanaugh wrote that presidents should be shielded from legal proceedings while in office. Nominated to fill the seat of retiring Supreme Court Justice Anthony Kennedy, Kavanaugh told lawmakers he has not hesitated to make unpopular rulings in the past. He cited his opinion in a case releasing Osama bin Laden’s former chauffeur, Salim Ahmed Hamdan, from detention at the U.S. military facility at Guantanamo Bay, Cuba. 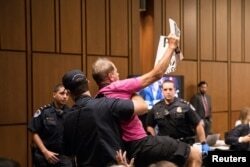 A protester is arrested as Supreme Court nominee Brett Kavanaugh testifies during the third day of his confirmation hearing before the Senate Judiciary Committee on Capitol Hill in Washington, Sept. 6, 2018. While Republican senators posed many questions on Kavanaugh’s overall judicial philosophy, Democrats zeroed in on controversial issues, including gun ownership and abortion rights in the U.S. The committee’s top Democrat, Dianne Feinstein, sought assurances both Wednesday and Thursday that the nominee views as settled law the Supreme Court’s landmark 1973 decision, Roe v. Wade, establishing abortion rights nationwide. If approved by the Republican-led committee, Kavanaugh’s nomination would go to the full Senate, where Republicans will hold a slim 51-49 majority.No Republicans have said they plan to vote against Kavanaugh. Dozens of Democrats have announced their opposition.